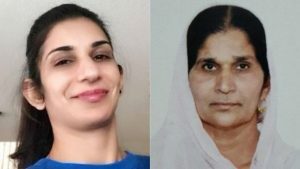 DALWINDER Singh, 29, of Brampton on Saturday was charged with second-degree murder in the death of wife and his mother-in-law. Ontario’s Peel Regional Police’s investigators from the Homicide and Missing Persons Bureau made the arrest in Peel Region’s first and second homicides of 2018. On Friday, January 12, at 10:45 pm, Peel Regional Police responded to a call at a residence on Starhill Crescent in the Sandalwood Parkway and Dixie Road area of Brampton. Upon arrival, police located two dead victims inside the residence: 32-year-old Baljit Thandi and her mother, 60-year-old Avtar Kaur. Both victims had sustained fatal stab wounds. Dalwinder Singh was located within the residence and placed under arrest. He has since been charged with two counts of second-degree murder. One media report said that a child that was located uninjured in the house is now in the care of the Children’s Aid Society. Anyone with information relating to this investigation is asked to call investigators at the Homicide and Missing Persons Bureau at (905) 453-2121, ext. 3205. Information may also be left anonymously by calling Peel Crime Stoppers at 1-800-222-TIPS (8477), or by visiting www.peelcrimestoppers.ca or by sending a text message to CRIMES (274637) with the word ‘PEEL’ and then your tip.